The Noble Skiodo ‘NB39INT01’ is priced at Rs 16,999 and is now available on Flipkart. 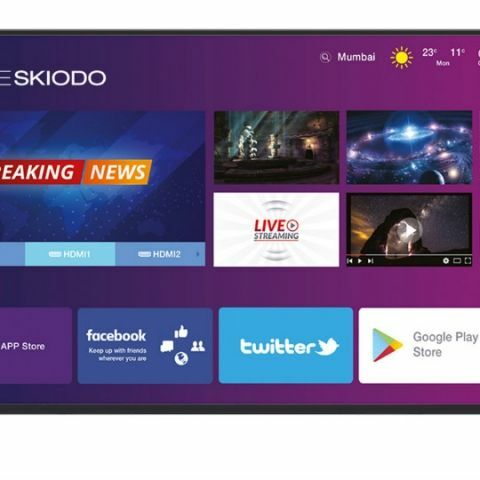 Noble Skiodo launches its first 39-inch Smart HD TV ‘NB39INT01’ with Intelligent UI. The TV is priced at Rs 16,999 and is now available on Flipkart. The company claims that the TV has a moisture free components construction. Users can play 4K content on the TV that comes with Cortex A7 Quad core CPU, along with 8 GB inbuilt memory and 1 GB RAM. Continuing with its Smart LED TV series line-up, Noble Skiodo, a part of Viera Group (One of the largest OEM for Consumer Durables in India), announces the launch of its newest Smart TV experience with ‘NB39INT01’ which provides high contrast crystal clear picture. It brings access to a wide variety of apps and services, one remote control and seamless convergence of content with your smartphone. The 39” HD screen is supported by 1366x768 pixel resolution and 16.7 Million colors, that brings 4KUHD ready media playability, greater clarity and detail than seen before. The stable and deeply integrated Android support on the LED TV ensures the very best of experience. One can also play 4K content on the ultra-fast and user friendly Cortex A7 Quad core CPU, along with 8 GB inbuilt memory and 1 GB RAM. Enhance the experience wire free with inbuilt Miracast support and E-Share app that displays content from the Smartphone or any device onto your TV screen. The TV also supports Intelligent User Interface (UI) that allows direct content on TV home screen as per the customer interests. The intelligent UI in the TV offers the viewer 3,00,000 hours of viewing along with inbuilt user interest customised videos, that gives many options from several preloaded apps like Netflix, Hotstar, Prime. With the powerful audio output of 10W X10W from two different speakers, the TV gives you Cinema Zoom & theatre like ambience. The extensive connectivity options include, 2 USB Devices and 2 HDMI ports. Being a smart TV, it has got an Ethernet port & can also connect over a Wi-Fi network. The Smart TV comes with two remotes; one for all the TV functioning and other, a magic remote, which is an inbuilt keyboard and a motion sensor remote which makes navigating through the Television easier and quicker. The product is already available with leading retail and ecommerce stores across India. You can grab it now at Flipkart.com. Looking to buy 32 inch full HD smart TV with good video & audio quality. Can you please help with suggestions? Suggest a 32 inch Smart TV within 40,000 range.